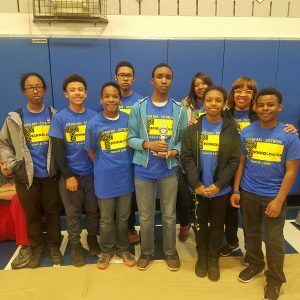 Detroit PAL launched a FIRST robotics program in 2018. We had more than 150 participants between our FIRST Lego League and FIRST Tech Challenge programs. The program has been a HUGE success so far, thanks to the help of our sponsors and supporters: Quicken Loans, FIRST in Michigan, and Frog Force. 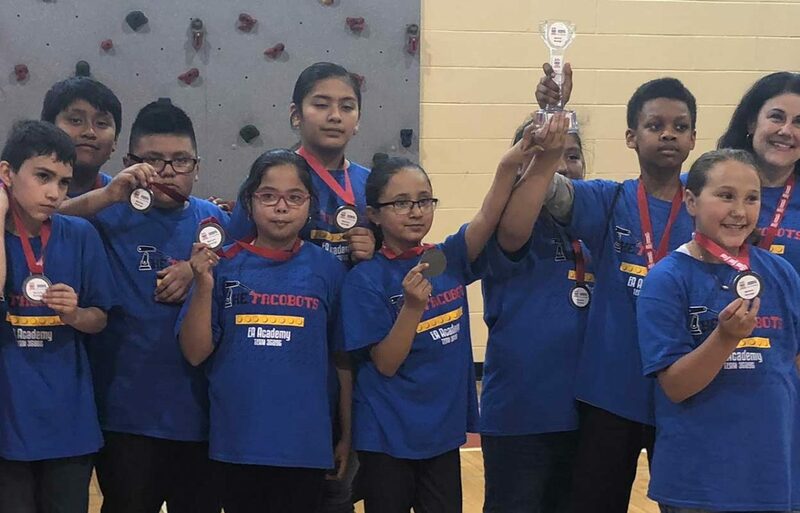 Our robotics participants had the chance to attend the World Championships at Cobo Hall last month and just competed in their first competitions in May. FIRST Tech Challenge (FTC) teams (10+ members, grades 7-12) are challenged to design, build, program, and operate robots to compete in a head-to-head challenge in an alliance format. On Saturday, May 12th, our PAL FTC teams competed in their very first competition at All Saints Catholic School in Canton. Schulze made it to the quarter-finals and the alliance of Palmer Park and Gompers came in 2nd place! USPM’s team earned the control award. The Control Award celebrates a Team that uses sensors and software to increase the Robot’s functionality on the field. FLICS was a finalist for the Connect award. This judged award is given to the Team that most connects with their local science, technology, engineering and math (STEM) community. Gompers was a finalist for the Motivate Award. This Team embraces the culture of FIRST and clearly shows what it means to be a Team. Palmer Park won the Judges Award! Congratulations to all of the FTC teams on a great competition! 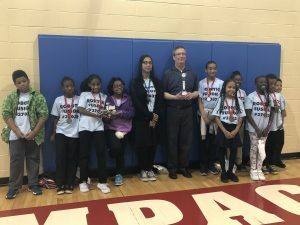 Our FLL teams competed on May 19th at SAY Play. Every year, FIRST LEGO League releases a Challenge, which is based on a real-world scientific topic. Each Challenge has three parts: the Robot Game, the Project, and the Core Values. Teams of up to ten children, with at least two adult coaches, participate in the Challenge by programming an autonomous robot to score points on a themed playing field (Robot Game), developing a solution to a problem they have identified (Project), all guided by the FIRST Core Values. Teams may then attend an official tournament, hosted by our FIRST LEGO League Partners. Detroit PAL teams competed in this challenge. In the team pits, everyone set up their poster boards that explained their research project. Matches went on in the morning and after lunch the teams began interviewing with their judges. Each team had to do a series of three interviews: one to present the robot, one to display their core values, and one to demonstrate their research project. DPAL Team Trail Blazers from Ann Arbor Trail won the judges award! DPAL Team The Tacobots from Esceual Avancemos Academy won the Project Award! Their research topic was the Zebra Mussel and how they are affecting our Great Lakes. DPAL Team Robotic Rockets from George Crockett won the Core Values Award. More pictures on Facebook: FTC Photos here and FLL Photos here.